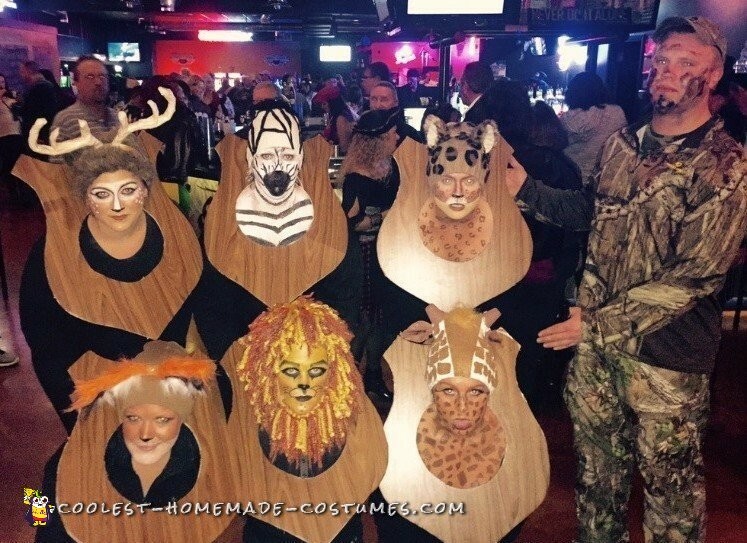 This year, our group of friends dressed up as a hunter’s trophy wall. Growing up in a rural area, this time of year is known as hunting season. We were further inspired by the recent events with Dentist Walters and Cecil the lion. This was a labor of love! After choosing our animals, we got together for three different girls nights full of crafting! Our most creative and artistic friend got to do most of the work… with our love, encouragement, and supervision. (I think she wishes we never knew about her hidden talents.) Supplies included foam board, wood contact paper, felt, headbands, beanie hats, face paint, foil, paint, faux fur, styrofoam cones, plastic flower leaves, and yarn. Lion: the lion’s mane was made by crocheting yellow, tan, and brown yarn. Deer: the deer antlers were made with aluminum foil wrapped with tape and then painted light brown. The antlers were screwed to a headband. Giraffe: the giraffe’s horns were made using styrofoam cones painted with brown fabric paint. We then glued felt spots and faux fur to the beanie hat. The ears were added last and were made from faux leaves painted brown. Fox: the fox ears were made by wrapping orange faux fur around a hanger shaped as ears. Black and white faux fur were also added to the inside. The ears were then hot glued to a headband. 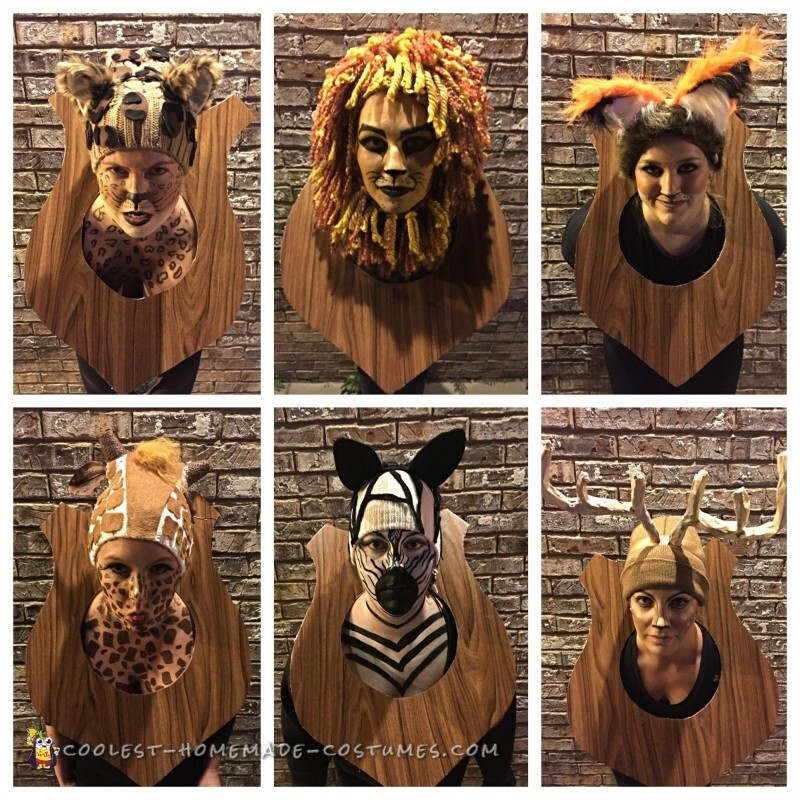 Cheetah: the cheetah head piece was made by glueing black and brown felt to a beanie hat to achieve the cheetah spot look. The ears were purchased online. Zebra: the zebra hat was made by glueing black felt stripes to a white beanie hat. 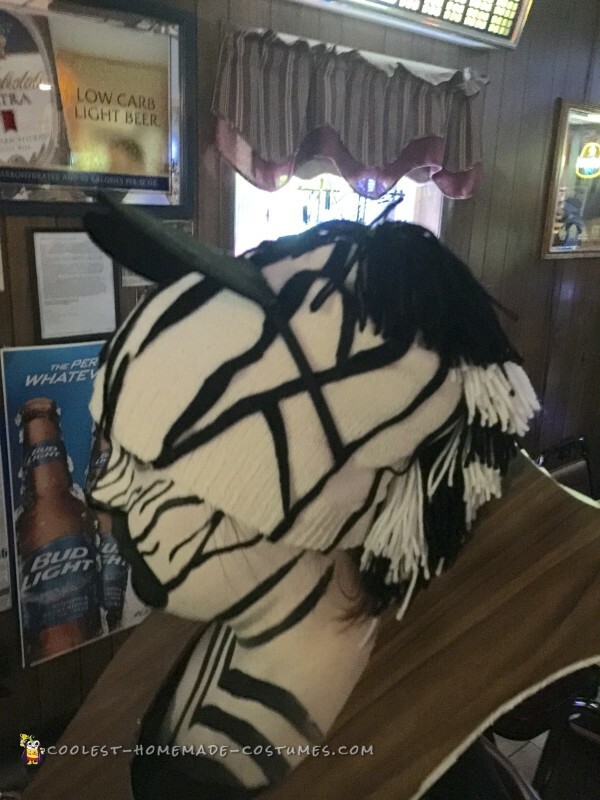 Black and white yarn were cut and hot glued to the hat for the mane. The black ears were made with felt and glued to a headband. The costume really came together with the face paint. We used Wolfe face paint and painted each other’s make up for approximately 6 hours. It was funny to see how realistic we were looking with the paint! The trophy plaques were cut from foam board, and the wood contact paper was added to the brown foam board to obtain a natural wooden plaque look. To appear “dead”, we dressed in all black clothes and shoes. We had a lot of fun in the costumes and received great responses from the crowd. 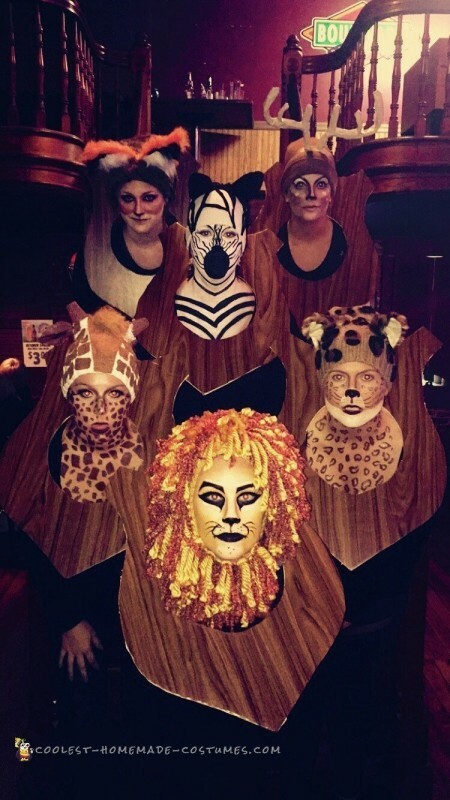 At each bar, we would line up for pictures and make the face of our animal which people seemed to love! Many people wanted pictures to send to their friends and family who were unable to attend because they were hunting over the weekend. The best part was that several of our friends couldn’t tell who was who! It was fun bringing home two 1st place prizes and one “most original” prize… This made the 6 hours of make up worth it!